In the days since the #CancelPinkwashing action at the reception hosted by A Wider Bridge at this year’s Creating Change conference, media has been abuzz with claims about the alleged violence of the protestors, supposed anti-Semitism at the conference, and more. We are issuing this statement, as the collective at the heart of #CancelPinkwashing, to dispel myths and refocus on our central demands and goals moving forward. Our evening began with a queer, anti-Zionist Shabbat service organized by Jewish Voice for Peace — Chicago, Committee for a Just Peace in Israel-Palestine (CJPIP), and other campaign partners in response to a real need for spiritual space that did not conflate Judaism with Zionism. Other groups, in coordination with A Wider Bridge, held their own Shabbat service elsewhere at the hotel. Contrary to Zionist media framing, both Shabbat services completed without interruption. Amongst our demands we also included that The Task Force publicly endorse the Palestinian Right To Return, that is that Palestinian refugees and their descendants have a right to return, and a right to the property they themselves or their forebears left behind or were forced to leave in what is now Israel and the Palestinian territories. For those that are unsure of geography, that is from the river to the sea. Our other demands, including our call for the Task Force to endorse BDS, the boycott, divestment, and sanctions movement, can be found here. During the course of the action, four protesters rushed the stage at the reception and shared our core messages while the remaining others occupied the hallway outside. During this time, Zionists exited the reception, shouted at the protestors and pushed and physically intimidated several. Police were called by the Hilton hotel and towards the end of the action, they escorted members of A Wider Bridge outside the reception room and down the back stairs, effectively shutting down the reception. We, the protesters, then made our way back down to our original location. To our knowledge there were no arrests made during the action, and some of our protesters sustained injuries due to the action of Zionist agitators and security staff. A few of our goals were accomplished, namely that we shut down the pinkwashing reception and raised the national visibility of pinkwashing as a Zionist tactic. We also actively pushed back on the overall complicity of Creating Change and the Task Force. We should note that this is not the first time that the Task Force has been criticized for marginalizing people of color or cultivating racism at Creating Change. In fact, these criticisms and protests are commonplace at the Conference. Whether this year or in the past, the Task Force has invited both police and ICE — with blatant disregard for many, many queer/trans activist communities of color. 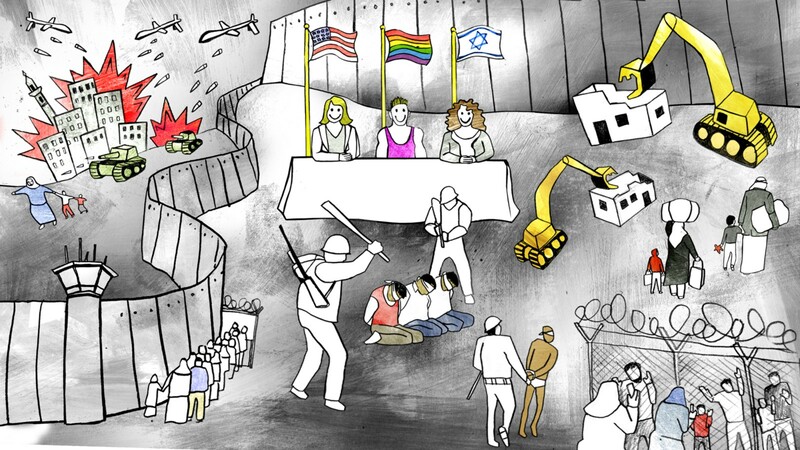 We call on the Task Force to take a firm stand against colonialism, racism and apartheid and refuse to host pinkwashing events by Israel advocacy organizations, ICE or the police. At this point, the Task Force has not apologized for or addressed any of the concerns raised by activists around pinkwashing at the conference. Instead, they issued a statement to “condemn anti-Semitism”, saying “Hate speech of any kind is unacceptable whether it’s directed at Jewish or Muslim people,” with no reference as to why that is a relevant concern in this situation (except, of course, as a response to Zionist agitators and media). In doing so, The Task Force continues to accept and endorse the false narrative that the Israeli occupation of Palestine is a “religious conflict” rather than a political and economic colonial project. We also believe that by releasing the statement, the Task Force conflates anti-Zionism and indeed all criticism of Israeli policy with anti-Semitism, which trivializes the very meaning of anti-Semitism, and exploits the term in order to silence political debate and distract from occupation and colonialism, which are at the heart of this issue. We are extremely disappointed by the unaccountable, racist actions of the Task Force as an institution. We will continue to press them on our demands and move forward in our work to confront pinkwashing and push LGBT organizations to name and reject their complicity in colonial occupation. We are a collection of anti-Zionist, anti-pinkwashing activists.